Strawberries! Nothing can define exoticness better than strawberries. Why do we love growing strawberries so much? Is it the taste or the flavor or the price it enjoys in the market.. Sure there are lots of other fruits that are more expensive than a strawberry but strawberry still has the crown(pun intended). 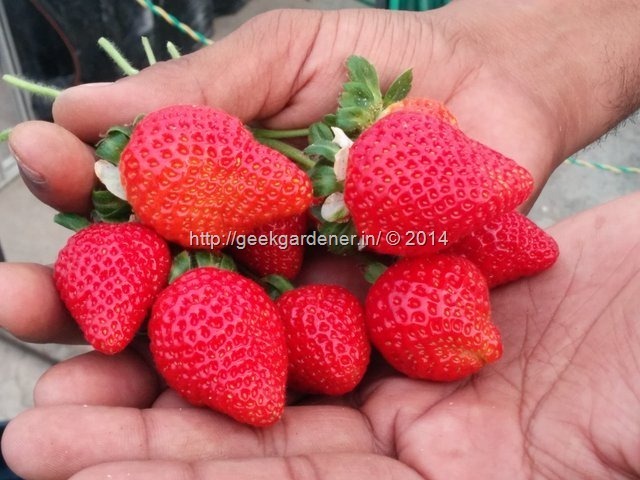 We recently participated in Lalbagh flower show and in our stall we displayed strawberry plants laden with fruits. They were displayed in our hydroponic floating raft system. I was so surprised of the attention that these plants drew from the crowd. Every single person passing through our stall talked about it. There were funny moments too. Some thought it was lychee and some, cherry. Some also made sure they tell us that strawberry grows in trees. Though every one were so in love with the plant, the biggest question still remained to be answered. 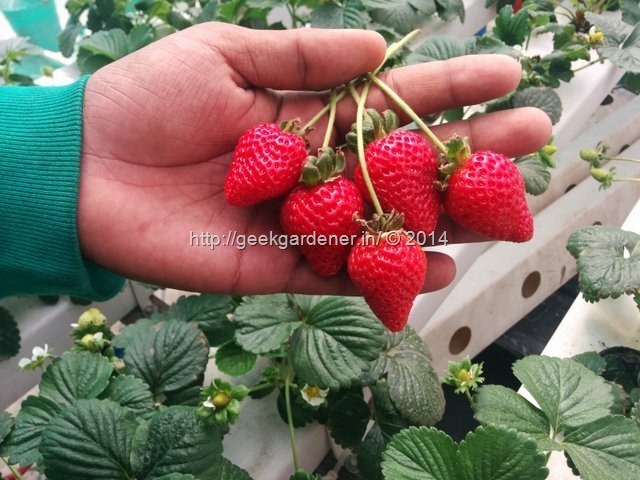 “How to grow strawberries?” What special care does it need? the list goes on. 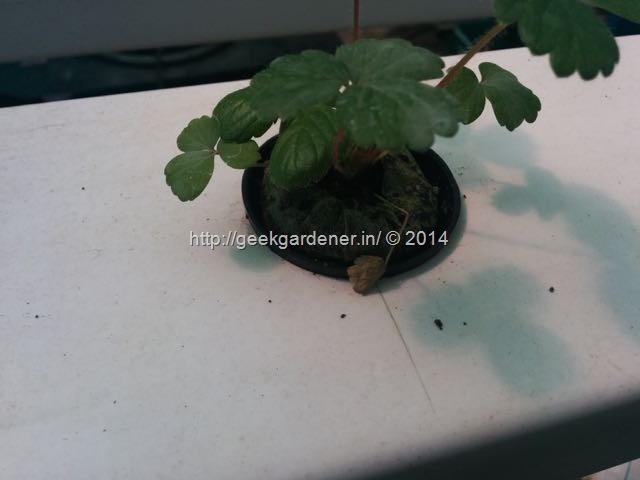 This post is to clear all the doubts regarding growing strawberries for a home garden. With these tips on growing strawberries, you can have your own strawberry patch that provides lots of strawberries. How does one start growing strawberries? Does it come from seed ? What are strawberry runners? So many questions.. read on for answers. Where does strawberry plant comes from? Seeds of course! Not just strawberry. Every plant in this world comes from seed. There are also other means of propagating them but they definitely come from seed. Now don’t ask me what came first seed or the plant? One might wonder where are the seeds in the strawberry fruit ? Strawberry seeds are actually found outside the fruit. Those small spiky things that you see on the fruit skin are seeds! 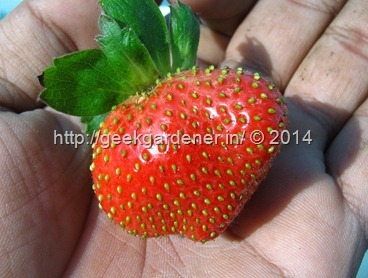 So next time you eat a strawberry, pick few seeds from the fruit and do a seed sowing experiment. Most of the strawberries sold in the market are hybrid ones. Saving seeds from them may not yield the same strawberry that you took the seeds from. For the kicks, you can save seeds and try germinating them. But if you are serious about this, I would suggest you get runners from a good source. For this reason, strawberries are never propagated via seeds for commercial production. 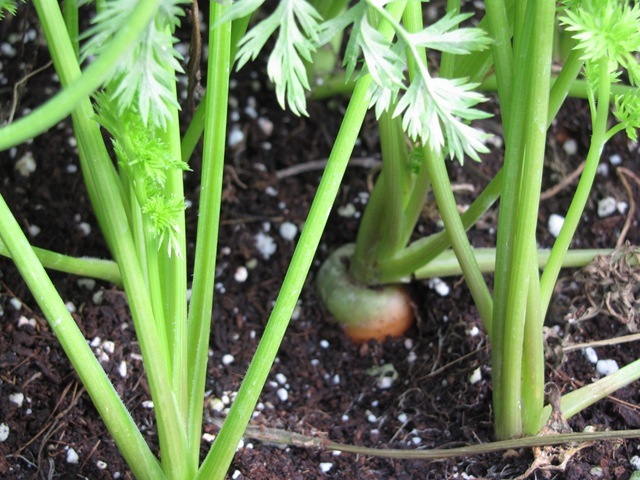 Seed propagation is only carried out by breeders. 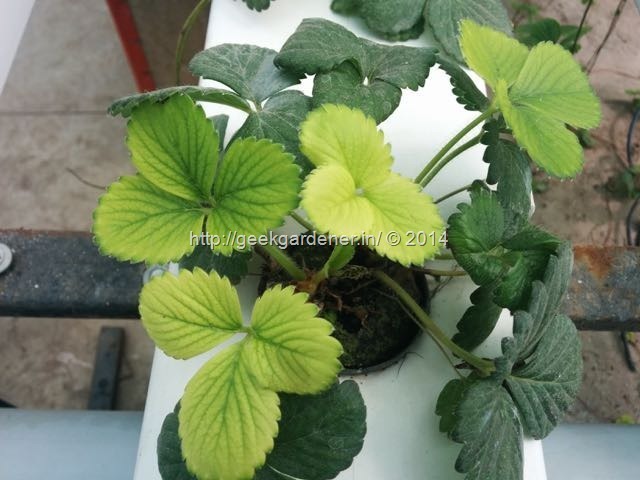 Runners are the most common way of propagating strawberry and they are easiest and fastest way of multiplying plants. Runner is the name for the stalk that comes from the strawberry plant that has a small plantlet at the tip which when buried in soil produces roots and becomes a individual plant by itself. Once the roots are established, the connecting stalk/umbilical can be cut and the new plant can be moved to its destination. 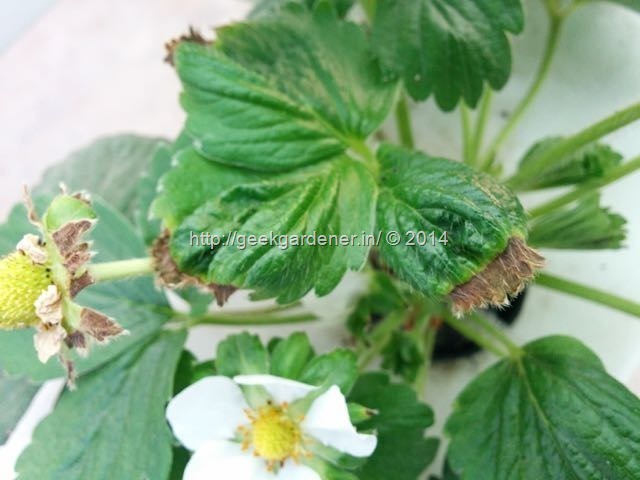 Besides sending runners, strawberry plants also develop multiple plants joined at their crown. These plants can also be separated and planted. The plants have to be separated carefully so as to not damage the roots. No matter what source you received your plants from, the planting strawberries have to be done in a proper manner to achieve best yields. 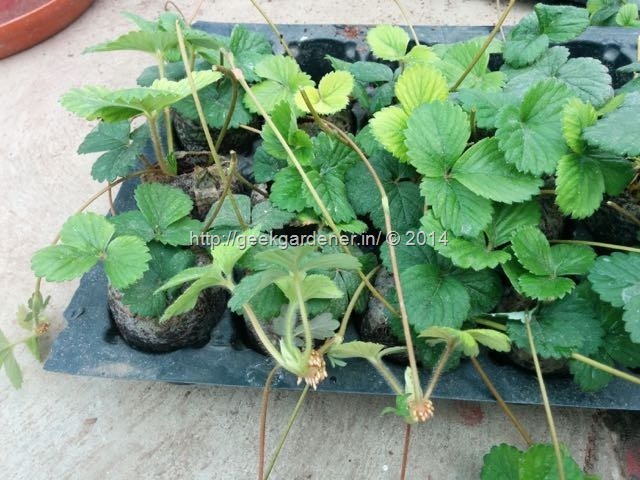 Strawberry plants like a well drained soil. You can easily make an ideal soil mix that is well draining yet rich in nutrients. Red soil compost in the ratio of 1:1 or cocopeat and compost in the ration of 1:1 is a good mix to start with. Adding perlite to the mix will make it more draining. A 20% of perlite by volume of the mix is good enough. Plant the runners/saplings in the potting soil, water them immediately. Ensure the container has drainage holes to drain out excess water. For soil/soilless mix, the following regimen can be followed. NPK 19-19-19 @3g per liter once every three days and calcium and magnesium can be applied via dolomite lime. Depending on the cultivar, the plants might start sending out runners. Runners can be a good thing and a bad thing. If your primary goal is to multiply plants, then runners are what you want. Multiple runners can drain the plant of its energy and can result in a non-vigorous plant. It is also detrimental to fruit production. If fruit production is your goal, never let runners form. When you start seeing small flowers being formed, it is time to switch your fertilizer to a bloom formulation which is nothing but a NPK ratio that has more potassium and less nitrogen. You wont go wrong with something like 5-15-30, 6-12-36 or 8-25-25. 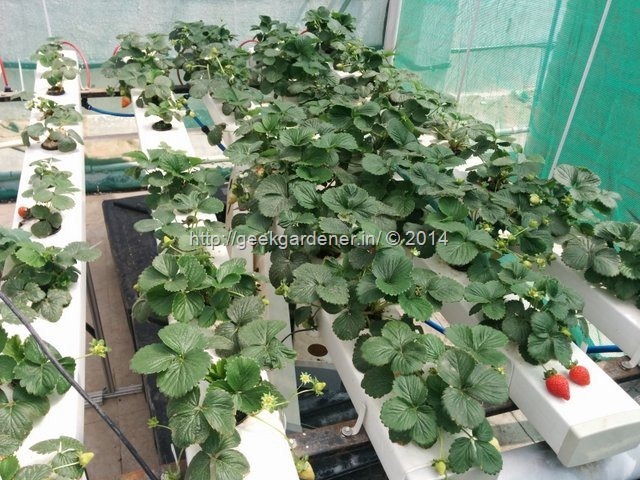 Growing strawberries hydroponically in an NFT system requires the plants to be placed in net pots. 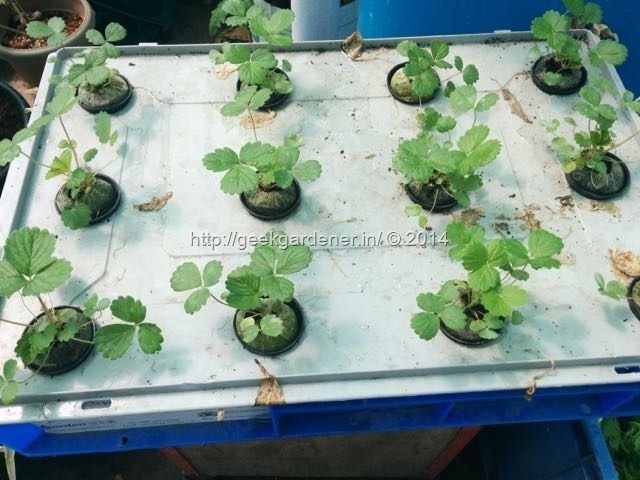 The bare rooted strawberry runners can be placed directly in the net pots and expanded clay medium can be filled to close the gaps and also provide anchorage to the plant. Alternatively if the strawberry plants arrived in preformed plugs, the plugs can be directly inserted into net pots firmly. The net pots are then placed in the NFT gully/channel. 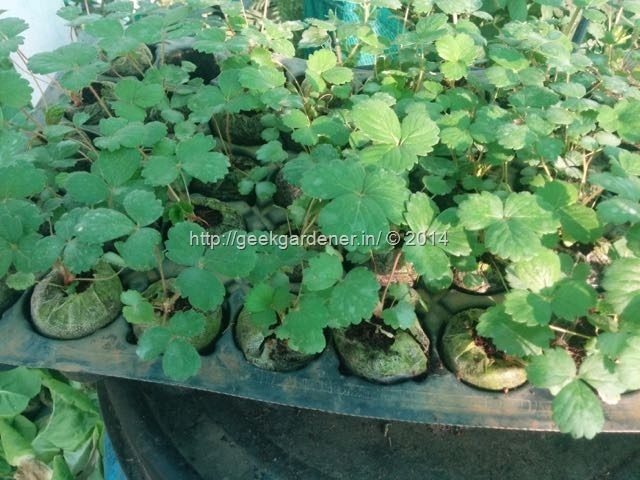 They are placed such that the bottom of the netpot touches the top of the nutrient solution. This is essential for the first few weeks when the root system of the strawberry plants are still developing. This also keeps the plug moist all the time. The nutrient flow in the channel should be 1-2 liters per minute and the circulation pump should be running 24×7. It is recommended to aerate the nutrient solution with an aquarium bubbler to increase the oxygen content. If there is a fall of the nutrient solution from the return pipe to the reservoir, the fall also causes some aeration. Our collection of strawberry plants we started with came from tissue culture. They were actually quite very tiny and needed the care of a new born. 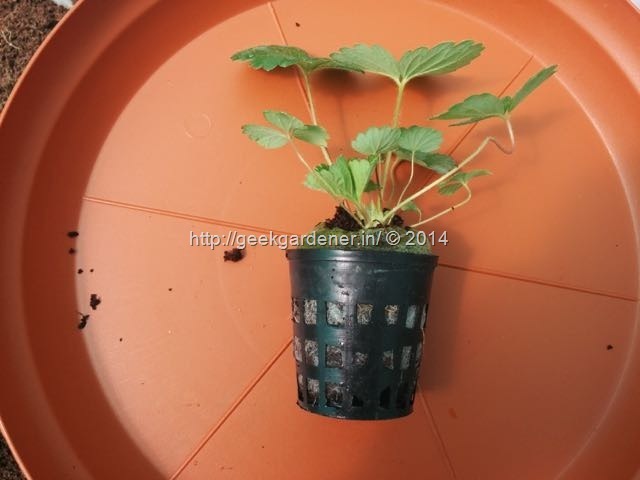 The strawberry seedlings are removed from their nursery and placed in a net pot. This net pot is then placed into an pre-drilled hole in the NFT channel. The plug size and net pot size should be match for a proper fit. The plant should be firmly held in the net pot and also it should provide a way for roots to come out. 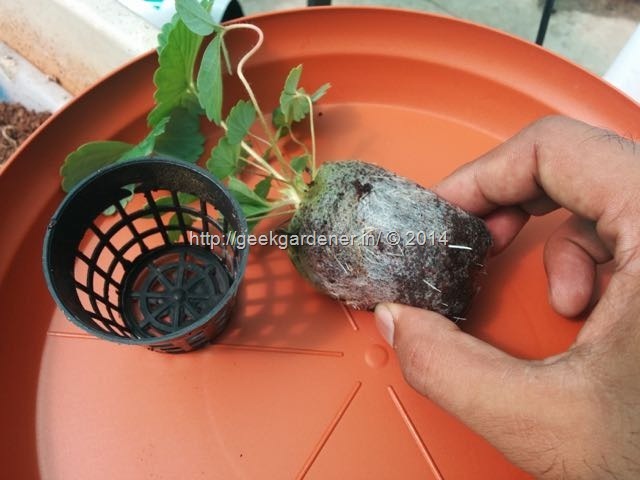 Check out the roots on that plug, it is easier to put the net pot when there are not many roots. 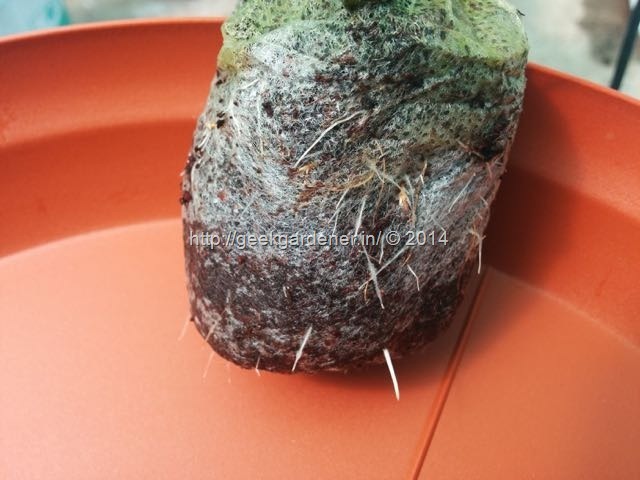 Roots that are grown too long will get cut if you insert the plug into the net pot. Take care while you handle these tiny strawberry plants. they are sensitive. The way to fit the plug in the net pot is to give a gentle squeeze so that it fits snugly in the net pot. Again, be gentle! This is how it looks once the plant is fit inside. 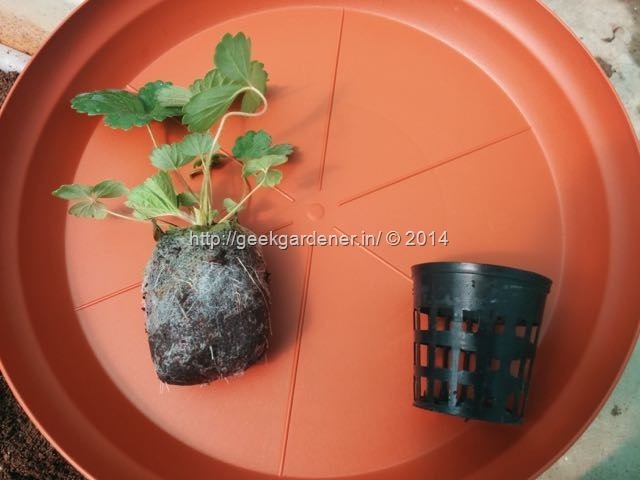 After the strawberry plant is placed, the roots will come out of the slots present in the net pot. The plant is placed in the channel. When you place the plant in the channel, make sure you have set it up first with the circulating nutrient solution. Every channel should get nutrients flowing at the rate of 1-2 litres per minute. After you place the net pot in the channel, check if the bottom of the net pot is in contact with the nutrient solution. This is very important for the young plant to grow. If the plug doesn’t touch the nutrient solution, the roots will not grow, eventually the plug will dry out and plants dies away! The finished system should look like some thing below. The yellow thingy you see is a sticky yellow trap to attract and trap white flies. Very effective. 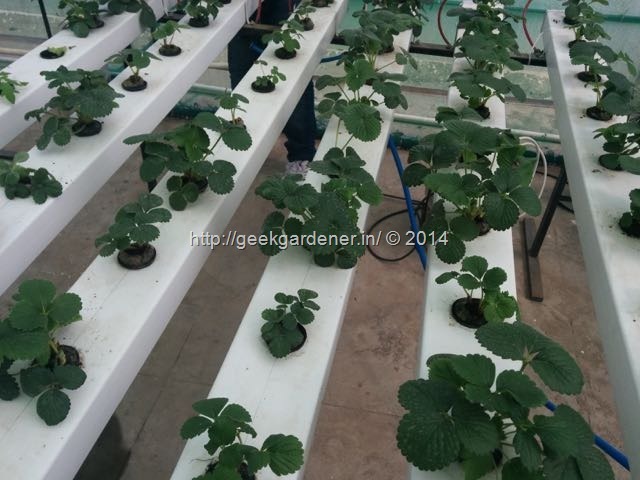 There is no rule that you should be growing strawberries only in hydroponics. You can try your hands on Raft system as well. Here are a dozen plants growing in the raft system. Once you have transplanted into a system, the plant will start growing provided the right amount of fertilizer. 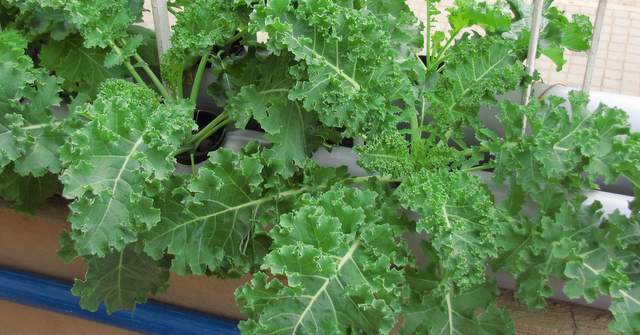 In hydroponics, nutrient plays a major part. The right nutrient in the right concentration is the key to success. Strawberry plants grow vigorously during their vegetative phase. They develop lots of runners and also produce plant divisions at their base. This phase makes the plant bushy and prepares the plant to support many fruits. In the picture below, you can notice runners falling out of the nft channels above. I use these runners for multiplying the strawberry plants. With one plant, you can make close to 5-6 plants easily if you let runners form. While it increases the number of plants, the fruiting does get affected. If you want the plant to produce flowers and start fruiting, trim off all the runners. 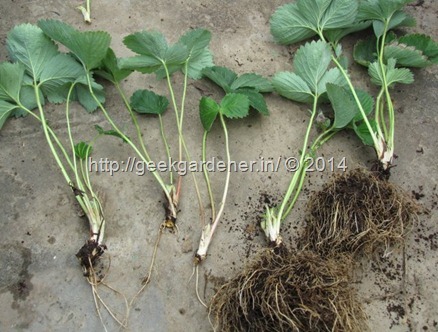 These are strawberry runners cut off the mother plant after they are rooted in the plugs. Now they will be individual plants themselves. For a recirculating system like NFT, the following nutrient protocol can be followed. It is important that a water test is conducted before using any solution and appropriate adjustments are made as per the analysis in the test report. The micronutrient mix is mixed as above. Mixing this will result in a solution of EC 1.8-2.0 provided the base water has less salinity. 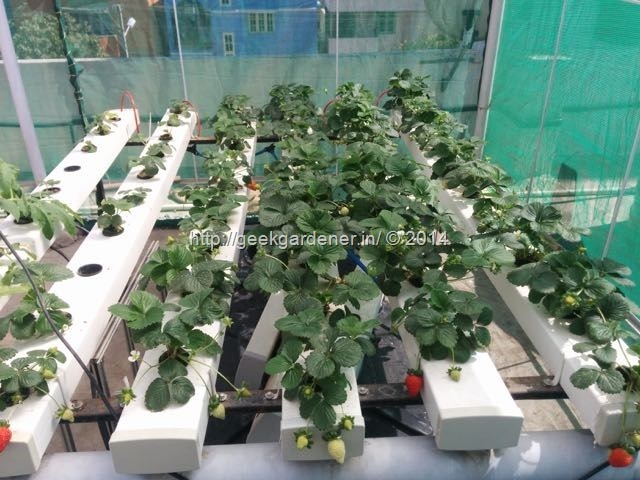 The ideal conductivity for strawberry is 1.2-1.5 during growth phase and 1.8-2.5 during fruiting phase. Higher the temperature, lesser the EC. As seen in the picture, all the runners are removed. EC also was raised gradually. 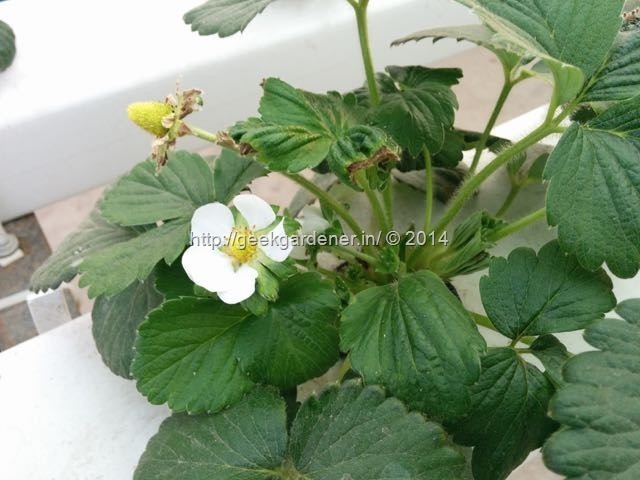 The strawberry plant responded promptly by growing in size and flowering. Now that the runners are gone, there is more energy for the plants to focus them on flowering and fruiting. The system in flowering stage. This system was in our greenhouse located on top of our Hydroponic Store. We had lots of customers insist that we sell some grown plants for them. 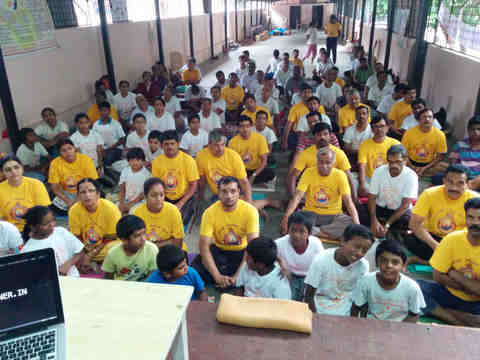 We did sell few plants and planted smaller plants in their place. You can see the plants in different age groups. We had a good harvest. Off the 30 plants that we had producing strawberries, we would get at least 15 strawberries a day. They were nice shaped ones. They tasted great too! 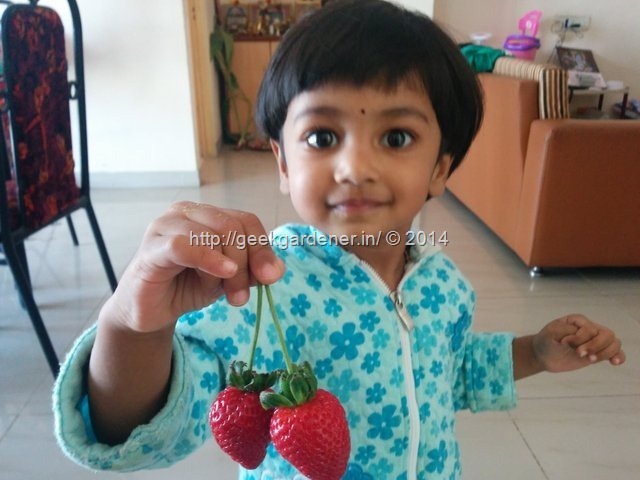 My daugher Dhwani, had a blast with these strawberries almost every day. “Yummy Stawbelly” is her favorite. 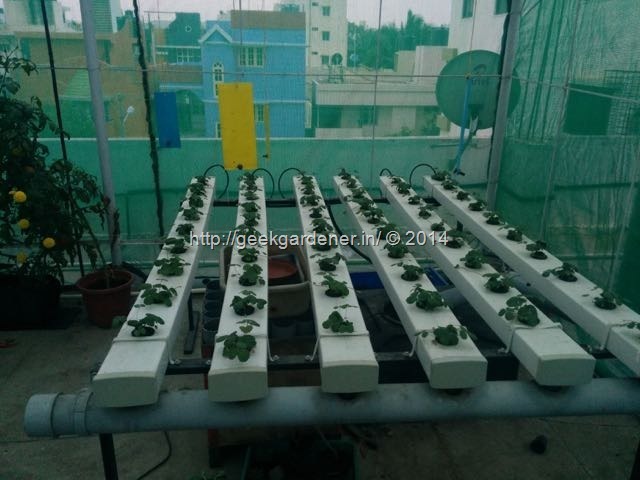 Hydroponics NFT system is relatively maintenance free. That said, there are few things one has to keep in mind. The nutrient solution, its pH and conductivity. There are meters to measure both the parameters. pH meter measures, well, pH!. Electrical Conductivity meter measures EC. Its good to have both of them if you want to manage a system properly. It also helps to learn about hydroponics by studying the effect of plant growth on EC and pH and vice versa. If you would like to know what is pH and conductivity of a solution, I am working on a hydroponics series that covers from the basics to advanced topics. Stay tuned. How often to change the solution. This is one of the trickiest part and most of the times, problems arise because of this. Understanding what the plant takes is important to take a call on this. When the plants are small, they take less nutrients and as they grow their consumption goes higher. Also, in summer, plants consume more water and in winter the consumption of water is less. This is mainly due to transpiration. Measuring the conductivity on a daily basis will help us to figure that the plants are taking more water or more salts or both. if the EC is climbing up, the plants are taking more water. We should refill the tank and reduce the EC of the solution to avoid salt buildup. Measure the volume in the tank everyday.Refill the tank if it goes below the required volume. Once it is refilled check the EC and pH adjust so that the final values fall in the optimum range needed for the plants. There isn’t any ideal period after you which you dump and make a new solution. After every refill ( either with water or with nutrients), the solution sways away from the ideal formulation. After a couple of refills, there is a chance that solution is totally out of balance. Using an EC meter is only going to tell us the total amount of salts present it the solution and not their composition. So generally, if the reservoir is very small, dumping the solution can be done every 10-15 days. For larger reservoirs in the range of few 100s of liters. May be once a month. ( this is again depending on the system size). Should there be any deficiency of disease incidence like root rot. Immediate dumping will be required. pH is not in the right range. This leads to unavailability of certain elements. Precipitation of salts. If they salts are not dissolved properly , then they might react and form a precipitate that is not soluble in water, locking out some elements. Root disease such as root rot causing plants to not take up nutrients. Environmental stress such as extreme temperature, humidity etc. 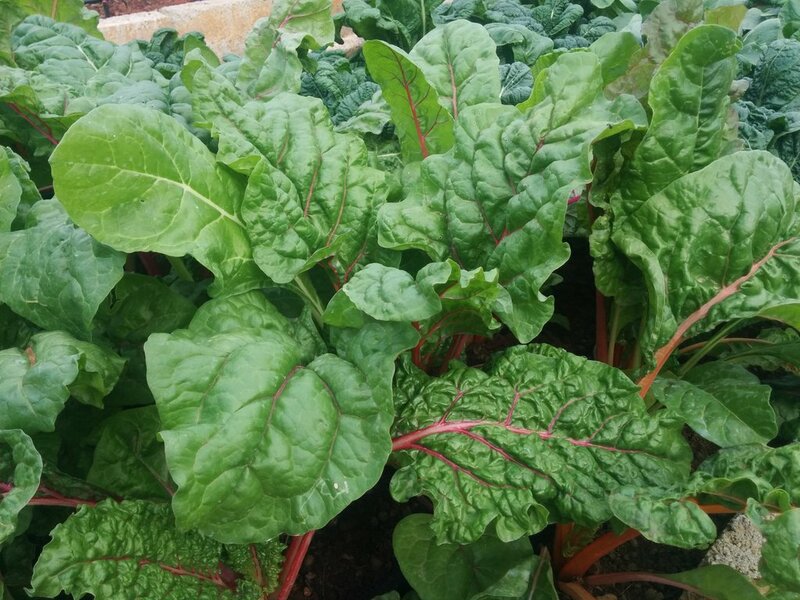 In this NFT experiment, I came across iron and calcium deficiency and pictures are below to help you identify the same in your garden. Iron is an immobile element. That means, it cannot be moved from old leaves to younger leaves should there be a deficiency. The symptom will always be seem in the newer leaves first. Iron Deficiency results on chlorosis ( lack of green color). The remedy for this is to find the root cause. Adjust the pH and verify if the right amount of iron is added in the nutrient. Once the corrective measure is made it is very easy to fix. Like Iron, Calcium also is immobile. It can only move with water. If water doesn’t reach some part of plant, calcium doesn’t reach. Calcium is important for cell walls. The deficiency of calcium results in leaf tips getting burnt due to lack of calcium in the cells.Calcium may be deficient due to unavailability of calcium in the solution, or simply the environmental conditions arent conducive. If there is no water flow in the plant, say for e.g the weather is cold, less light and then high humidity. The plants need not transpire. Less water uptake and less calcium. 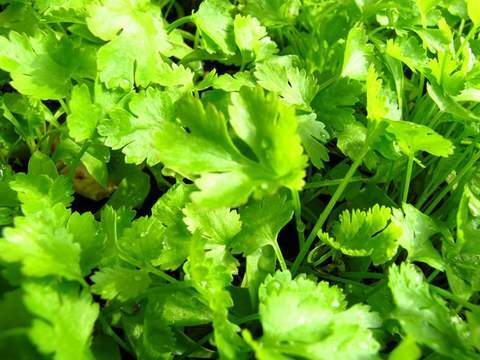 Pests are inevitable in a garden and hydroponics is no exception. Certain soil borne pests can be avoided with the use of NFT system. But sucking pests that are air borne are your worst nightmare. Remedy is to spray neem oil and also use blue sticky traps to attract them. Remedy is to spray neem oil @ 5ml per litre of water. That brings us to the end of this post. Quite a long post isn’t it? Send me your questions, comments. Stay tuned for the hydroponic series. GG, Your daughter is blessed, indeed. Where can I get the runners in Bangalore? It will great if you can provide a few or direct me to a nursery. Dear GG.. 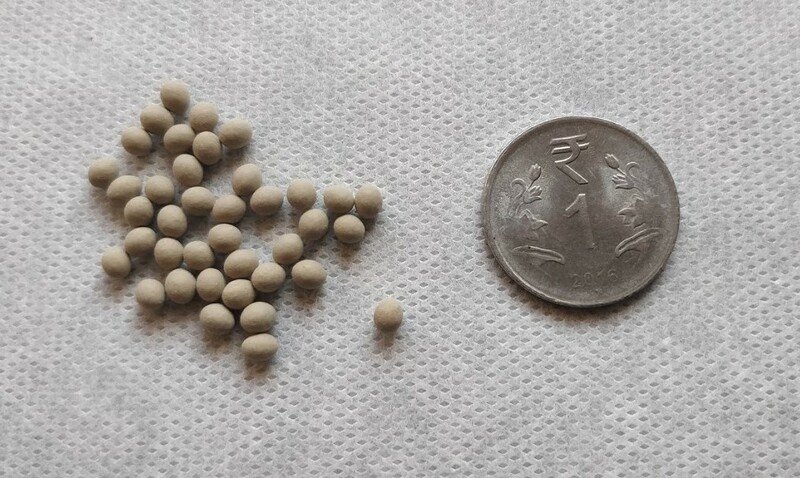 I am from Delhi.. Can Strawberry seeds give a nice yield too? Or I have to arrange for runners and plants only? Please guide me from where to get it.. Either good seeds or runners..
Another AMAZING article. You always go into such detail and include so many photos, I LOVE IT. Thanks again for taking the time to write such awesome articles! 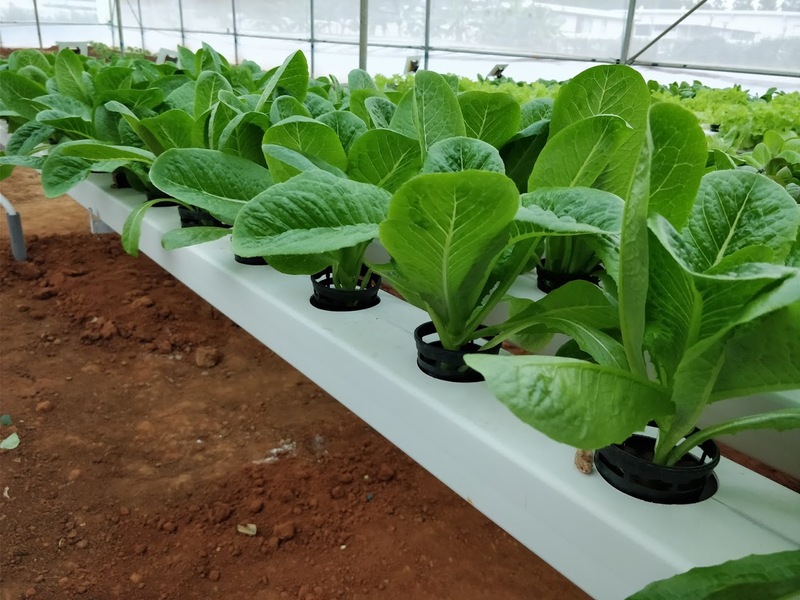 I am based in Thanjavur (Tamilnadu), I would like to set up hydroponic garden, I need materials and guidelines, kindly let me know the contact. Superb mate! This is professional! The setup I mean! Many thanks for sharing this. I know of a few gardening tricks, but this is not ordinary man! Quite tough for a part timer to replicate I guess. I am tempted to do this but the process appears to be too complex – too many parameters and too many formulae in nutrition. Is it really that complex? I mean, the regular plant growing tricks dont work? This looks like a ladyfinger plant – small, steady and standing (not a creeper), so a normal pot-growing does not work? Will try finding the runners in Lalbagh and will experiment. Thanks again. Nice article, very informative. 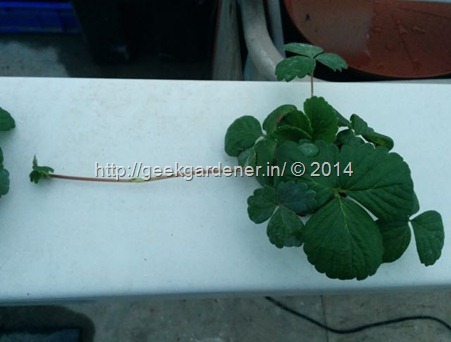 Can u please elaborate on how many strawberries can be harvested from one plant in NFT setup.? Are there any premix nutrient solutions available in market.? Also it would be helpful if u could share a guide on how to fabricate this kind of setup. is it possible to grow in Chennai, if yes what is season and where we get the seeds and tray. Hey thank you so much for this article! 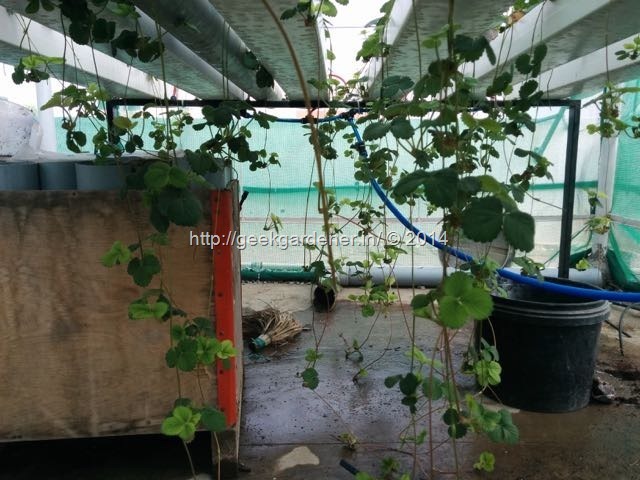 We are about to launch a hydroponics project in Thailand. We’d love to invite you and take care of your trip if you could share some info with us. Please email me. Are strawberries self pollinating? If not, indoor clearly is out unless hand pollination.? If I want to grow plants organically ,is hydroponics the right method? Because of the use of chemicals in hydroponics, it is not considered organic. Thank you so much for the informative detailed post! I haven’t seen anything like this even on University extension websites, so thanks again! I have strawberries in cocoa which is technically still hydroponics but not NFT or ebb & flow, so it’s hand watering drain to waste. I’m going to test the runoff today, but I just shared my first (hand pollinated) strawberry with my father; as beautiful as it was, it was tart! Tasted like a strawberry and was dark red, I have photos but don’t know how to post them on here. I usually measure TDS in PPM, but can switch my meter to read EC. I use the FloraSeries with R/O water. Thanks again! Sorry for the extremely delayed reply. Glad you liked it. I started terrace gardening 3 months back. We bought a grafted variety of pomegranate plant from a nursery 2 months back. Buds started to form last month. Once it is flowered and started the fruiting stage all the pods are falling down. Not sure it is because of the wind or the climate or pigeon. Could you please help me in this. 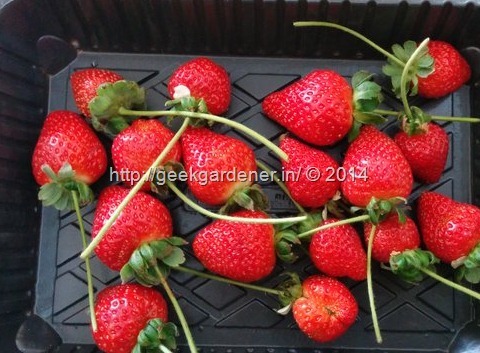 Is Bangalore weather suitable to grow berries? Have you tried growing blueberries or raspberries?